To promote your brand or product in the competitive market, quality product so custom packaging is the right way. Packaging serves the purpose of protecting, enclosing, and taking care of the products. It also ensures the process of proper shipping, storing and sale convenient. Almost all companies are investing in custom packaging to reach the top of the industry. Different options are available to pack the product regarding custom packaging. Bags, boxes, Tray & Sleeve and different style of containers are in use. But among various choices, custom boxes are the most suitable options. From enclosing the product in style to safe shipping, custom boxes can make it all possible. The most exciting thing about these boxes is that you can customize these from outside and inside. Custom boxes are more beneficial as compared to other packaging options. These boxes can be suitable for more than one product. Manufacturers appreciate custom as they made packaging solution easy for large as well as small business. When it comes to custom boxes, there are lots of other options. From bottom closure to top closure, custom boxes come in different styles with different features. Each box has its specialty and usage. But Tray and sleeve boxes can be helpful if you want one packaging solution for all products. Why Tray & Sleeve boxes?? Outside sleeve of these boxes can give your product or brand more visibility and a great reveal. Tray and sleeve boxes have more space than other boxes. It allows you to customize these boxes with specific designs and rich printing. Imprinted logo and brand name on the sleeve of the box will make your product stand out from the competition. Not the only logo, but you can also personalize these boxes in your way or according to customer’s desire. Tray & sleeve boxes are perfect packaging solution for small and medium-sized products. As the material used for their manufacturing is cardboard or paperboard. The box is small and light in weight providing easy handling during storing and transportation. Not only for shipping, but these boxes are also secure for customers to use and handle. Besides, it’s a lighter option but provide proper protection and security to the product due to firm bottom. After spending too much on the product, don’t settle for low-quality packaging. First impression matters and these boxes can make it happen. Tray and sleeve boxes can provide the perfect packaging solution without breaking your band. These boxes provide high-quality printing and customization at cheap rates. Not only has it will save cost in manufacturing but also in transportation and shipping process. Buying in bulk can help you to save more without compromising on quality. When designed properly, these boxes catch not only customer’s eye but also provide practical packaging for any product. A custom box should not be only for product enclosure or safety. It should be according to product size and style to give a proper perception of the product. Tray & sleeve style of custom boxes provide safety, proper enclosure, marketing, brand promotion and right understanding of the product. A well-designed tray and sleeve box can perform more function than a salesman. Whether the product will be display on retailer’s shelf or have to ship to customers, protection and safety are primary things to consider. The sturdy and durable material of the box provides exceptional support to the product. It also makes these boxes ideal for shipping and transportation. These boxes have the stiff bottom and cover-up sleeve which prevents the product from any damage. You can also insert extra protection inside the box for fragile and delicate items. If you have made your packaging eco-friendly, then you will have more chances to boost your sales and get more exposure. A recycle and reusable box can be a reason for customers to choose your brand. The conventional material of these boxes is recyclable. Moreover, customers can store these boxes as these are reusable. You can also make these boxes with Kraft material which is 100 % recyclable. There are many different productive ways to make it eco-friendly. Your product packaging needs to be as important as the product. 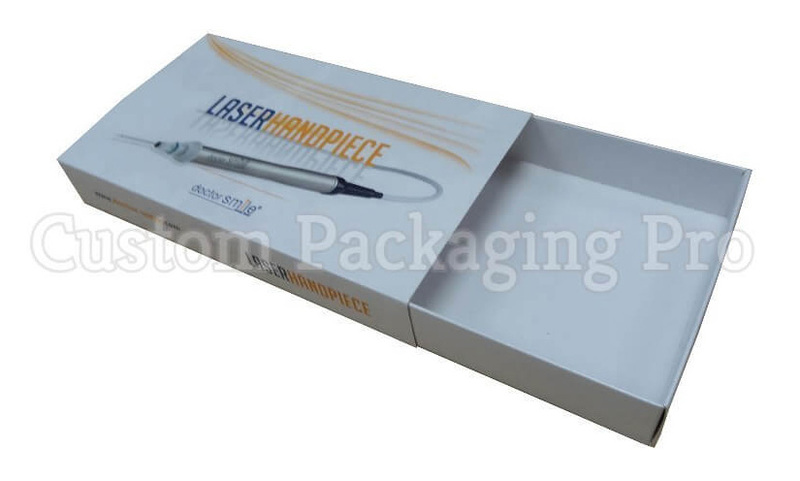 So, choose Custom Packaging Pro to create a lasting impression with Tray and Sleeve boxes.